Hinshaw, Raymond B., head-of-household, age 23, born in Iowa; parents born in Indiana; first marriage, married 1 year; occupation: farmer, general farm; rented farm. 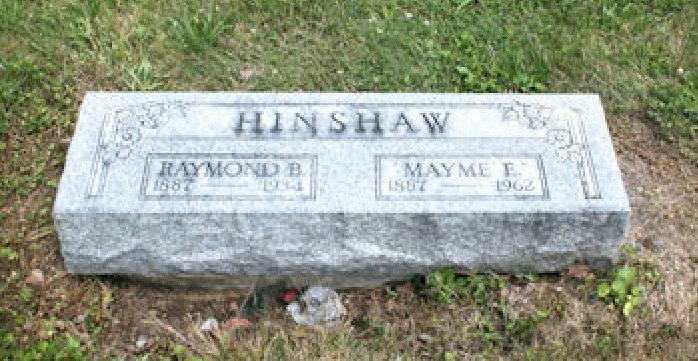 Hinshaw, Mayme E., wife, age 22, born in Indiana; parents born in Indiana; first marriage, married 1 year; no children. Hinshaw, Ray B., head-of-household, age 32, born in Iowa; parents born in Indiana; rented home; occupation: farmer, operator. Hinshaw, Mayme E., wife, age 32, born in Indiana; parents born in Indiana. Hinshaw, Helen E., daughter, age 8, born in Indiana; parents born in Indiana; attended school. Hinshaw, Caroline E., daughter, age 5, born in Indiana; parents born in Indiana. Hinshaw, Donald A., son, age 6 months [unclear], born in Indiana; parents born in Indiana. Hinshaw, Raymond, head-of-household, age 43, born in Iowa; parents born in Indiana; first married at age 22; rented home ($55 rent); radio in home; occupation: doctor, chiropractor; not a veteran. Hinshaw, Mayme, wife, age 42, born in Indiana; parents born in Indiana; first married at age 21. Hinshaw, Helen, daughter, age 19, born in Indiana; father born in Iowa; mother born in Indiana; attended school. Hinshaw, Caroline, daughter, age 16, born in Indiana; father born in Iowa; mother born in Indiana; attended school. Hinshaw, Donald, son, age 10, born in Indiana; father born in Iowa; mother born in Indiana; attended school. 1920 census, Guilford Township, Hendricks County, Indiana; roll T625-436, ED 36, page 21B, line #79, dwelling #501, family #516. 1930 census, 4th Ward, Indianapolis, Marion County, Indiana; roll T626-608, ED 50, page 11A, line #43, dwelling #217, family #227. 1910 census, Sugar Creek Township, Boone County, Indiana; roll T624-341, ED 20, page 218B, line #66, dwelling #87, family #88. Death certificate of Donald Andrew Hinshaw. Indiana Marriages, 1845-1920; http://www.ancestry.com (Book 13, page 104). Contribution from Gene & June Cordell.